The Upper James River Water Trail meanders through beautiful Botetourt County located just northeast of Roanoke, Virginia. The trail is organized into five segments, each offering a unique experience. Along the 45 miles of the Upper James River in Botetourt County, you can get up close and personal with the Allegheny and Blue Ridge Mountains. You'll experience the unspoiled beauty of the river as you paddle through scenic valleys and past rolling farmland while keeping a watchful eye out for native wildlife. Some Class I & Class II rapids along your journey will make it a fun day for all members of the family by canoe, kayak or tube. Please note that boating, canoeing, kayaking and other activities on rivers can be dangerous. Be sure to read the on-line safety recommendations and check the on-line water gauge levels. The formal water trail access points are open seven days a week year round. Due to water and air temperatures associated with a pleasant river experience most paddlers only access the water trail from April to October. There are no fees for launch site use. The James River Blueway is best used by canoe or kayak. Tubing and fishing are also popular activities. If you're bringing your own canoe or kayak, there are numerous public access points with free parking. Be sure to read the on-line safety recommendations and check the on-line water gauge levels. Consult local conditions prior to any river trip and follow all safety precautions! 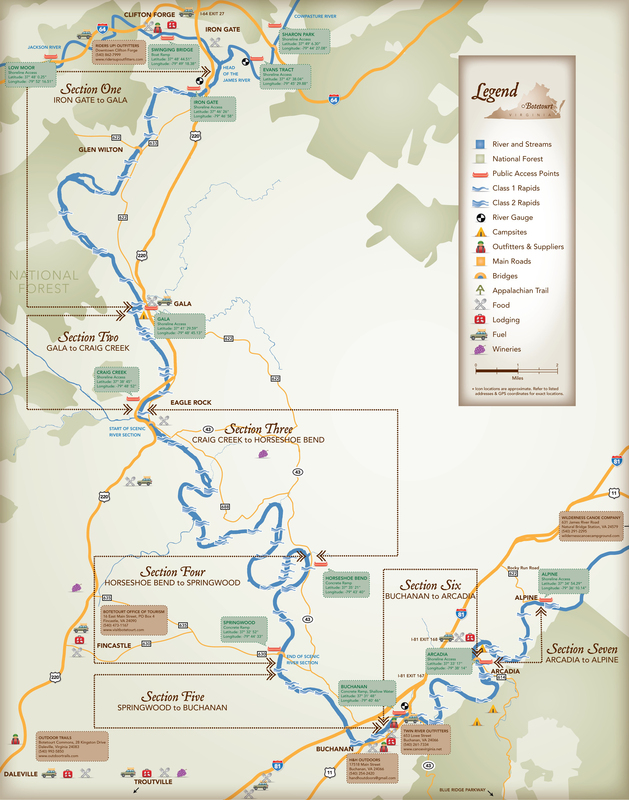 There are six public access points on the Upper James River Water Trail that are owned and operated by the Department of Game and Inland Fisheries in Botetourt County. These sites are provided for the public with the expressed sole purposes of Boating and Fishing. These sites offer free parking. Download the water trails maps for locations. Section five of the trail offers several campsites. Where can you launch your boat? The English settlers who sailed up the James River in 1607 were employees of the London-based Virginia Company, chartered by King James I. Investors in the company financed the journey. All of the Jamestown leaders, including Captain John Smith, were investors in and employees of the Virginia Company. The colonists’ job was to find gold or silver and a water shortcut to Asia, which had a lucrative trading market. The colonists were also instructed to cultivate land for crops and establish friendly relations with the native people. The Virginia Company sent supply ships to Jamestown and expected returning ships to be loaded with valuable commodities.